Aniah Ferguson, 16, has been charged with assualt and robbery for her alleged role in attacking a 15-year-old girl inside a McDonald’s in the New York City borough of Brooklyn. Police arrested a 16-year-old girl Thursday in connection with the savage beating of a teenage girl caught on tape inside a McDonald's in the New York City borough of Brooklyn. According to the New York Daily News, Aniah Ferguson, who police note can be seen during the three-minute attack wearing a hoodie and then only a bra, has been charged with gang assault and robbery because she reportedly took the victim's purse. The Daily News notes that this is the teen's sixth arrest. Other reported incidents include allegedly stabbing her brother in the arm during an argument that turned violent and punching her grandmother in the face. Ferguson's grandmother filed an order of protection against her after the alleged attack. Police are still looking for five other girls who they believe were involved in the melee. Although the 15-year-old victim has not been cooperative with police, according to the Daily News, she has apparently found some redemption in her newfound infamy. The Daily News notes that the teen, who can be seen being punched and kicked in the video as onlookers cheer and yell, has taken to Facebook posting, "Everyone Like I'm Famous Now." She has also posted photos of her face without bruises or marks to refute reports that she received two black eyes. In text accompanying one selfie, she tells her followers that she is "gucc! "—street slang meaning she is well. Some have questioned whether or not the photos posted to the Facebook account are current, considering that witnesses of the attack told the Daily News that she looked as if she had been beaten by a boxer. "Her face looked like a punching bag," a police source told the Daily News. "Her nose was broken and she didn't even know it." Both the attackers and the victim have received Internet infamy since the video beating went viral—something that Aniah's mom isn't pleased with. "I'm her mother and I'm not defending her," the Brooklyn woman, who didn't want to give her name, told the Daily News. "I didn't raise her like this. I don't know why she did it." 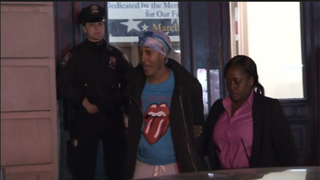 Aniah is scheduled to be arraigned in Brooklyn Criminal Court on Friday. Police said that thanks to Facebook, they have pretty solid leads on the other five girls involved in the attack. "Most of these kids identify themselves," a police source told the Daily News. "They either post the video, tag themselves in pictures or boast about being there." Police are still unclear as to what might have sparked the attack, but a new storyline is emerging that alleges that the victim may have set up a person who got shot in Brooklyn some weeks ago, according to the Daily News. Read more at the New York Daily News here and here.